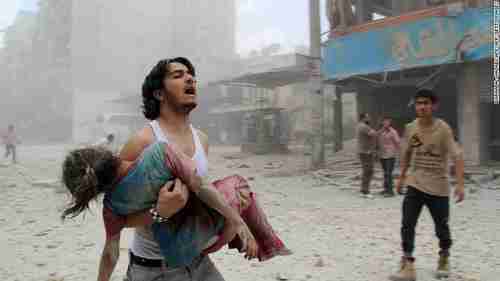 Wednesday was another day of a great deal of bloody violence across Syria, at a time when there is supposed to be a ceasefire in effect and peace talks in process. 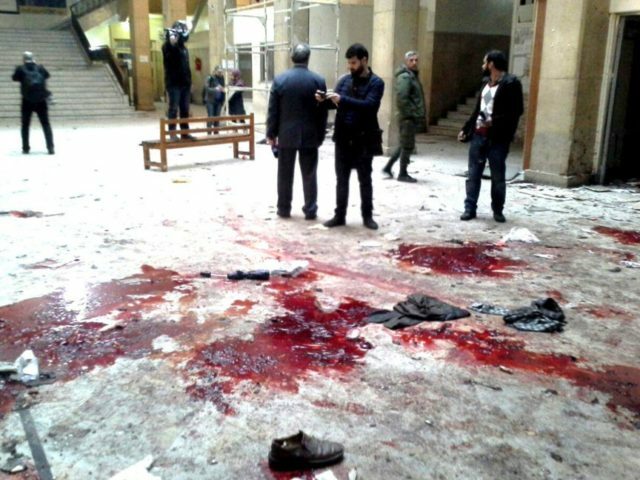 A suicide bomber blew himself up at old Justice Palace building, Syria’s central court, in the heart of Damascus. The terrorist, who was dressed in a military uniform and was carrying a gun and a grenade, was stopped by the guards at the external door of the old Justice Palace building. After he handed over his gun and grenade to the guards as he was told to do, he ran quickly towards the door of the lobby of the Justice Palace, where there was a large were a large group of people, and blew himself up. At least 32 people were killed and 100 wounded. An hour later, another suicide bomber struck at a restaurant on the outskirts of Damascus, killing a large number of civilians, mostly women and children. On Saturday, 74 people were killed and 120 more were injured. The casualties were mostly Shia pilgrims visiting one of Shia Islam’s holiest sites, the Bab al-Saghir cemetery. Two weeks earlier, a complex, well-planned terror attack in Homs on one of Syria’s most highly secure military installations killed 32 people. An indigenous Sunni jihadist group, Levant Liberation Committee (LLC), formerly the al-Qaeda linked al-Nusra, took credit for Saturday’s attack and the attack in Homs. Nobody has taken credit for the latest terror attacks in Damascus on Wednesday. LLC issued a statement denying responsibility for Wednesday’s attacks, saying that its targets are restricted to security and military installations, but that’s obviously a lie since Saturday’s attack was on innocent Shia pilgrims visiting a cemetary. A delusional Syrian official said that “the terrorist bombings reflect the state of collapse within the ranks of the terrorist organizations as a result of the resilience of the Syrian people and the victories of the Syrian Arab Army and its allies.” He added that Saudi Arabia, Qatar and Turkey are to blame for the terror attacks. The Syrian civil war — one of the world’s worst humanitarian crises since World War II — continues to be the most dangerous and destabilizing conflict in the Middle East today. Six years in, Assad has created a safe haven for ISIS and Al-Qaeda, while he commits unspeakable acts of violence against his own people. In other ceasefire activity, 21 people were killed in Idlib by Syrian and/or Russian warplanes. As we’ve been reporting, American troops have been deployed to the Syrian city of Manbij to keep the Sunni rebels loyal to Turkey and the Kurdish militias, both allies of the United States, from killing each other. They can observe each other’s movements. They can see each other. They are not talking to each other, and they are not hanging out together. Question 8: Now, US troops are in Manbij. Is the greenlight from your side? Did you open the door for these American troops? So it’s good to remember how we got here. The civil war in Syria was caused by al-Assad when he unleashed his army and air force against peaceful protesters in 2011. Up to that point, Turkey and Saudi Arabia were friendly with al-Assad. Things really turned around in August 2011, when al-Assad launched a massive military assault on a large, peaceful Palestinian refugee camp in Latakia, filled with tens of thousands of women and children Palestinians. Al-Assad’s unprovoked attack on this refugee camp, and the slaughter of thousands of Palestinian women and children, drew young jihadists from around the world to Syria to fight al-Assad, resulting in the formation of the so-called Islamic State (IS or ISIS or ISIL or Daesh). Sunnis in Syria itself turned against al-Assad, forming either “moderate” rebel militias or joining the jihadist Al-Nusra Front, which is now the Levant Liberation Committee (LLC). Al-Assad is responsible for displacing millions of Syrians, including over a million that have flowed into Europe as refugees.